I have been a carpenter and woodworker for more than 30 years. During that time I have been concerned about the best way to manage a finite resource. We as humans need to find other ways of doing things. We only have one planet. Using recycled / reclaimed timber is one way we can do this. 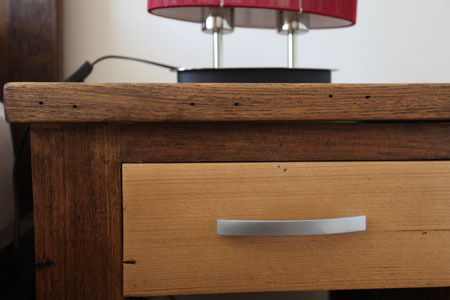 Australian hardwoods are some of the strongest and most durable timbers in the world. 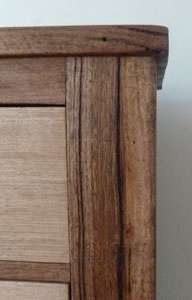 The grains and textures of Australian hardwoods are spectacular and I like to bring them out in my furniture pieces. Similarly, utilising FSC certified timber (for every tree harvested, five are planted) is another way we can alleviate the pressure on the forests of the world and is a wonderful way of making the most of a great resource. The depletion of rain forests in developing countries and in Australia is of great concern to me and is said to be a factor contributing to climate change. I can often be found scrounging around demolition yards and I’m constantly amazed at what I find. Milling costs are non existent, so I pass on the savings to my clients. I like to think outside the square and I’m inspired by the deco period and post-modern Arabic styles as well. My pieces are described by some as “out there” which I think is a great compliment. If a client has a particular style of furniture in mind, I can create something that reflects that style.